What is a LANDMARK FARM? 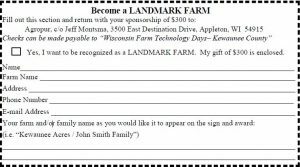 A LANDMARK FARM is farm located in Kewaunee County or the adjoining townships of the adjacent counties of Door, Brown, and Manitowoc, which choose to be a sponsor for Kewaunee County Farm Technology Days 2017. It is a working farm, producing agricultural goods. Dairy, livestock, cash grain, vegetables and specialty farming of all sizes and scales make up the diversity of Kewaunee County’s agricultural landscape, which we want to celebrate. Whether large or small, whether the farm has been in your family for a short time or a lifetime, we want to offer you this limited time opportunity to have your farm and family’s name associated with this great agricultural showcase. We are seeking $300 per LANDMARK FARM. 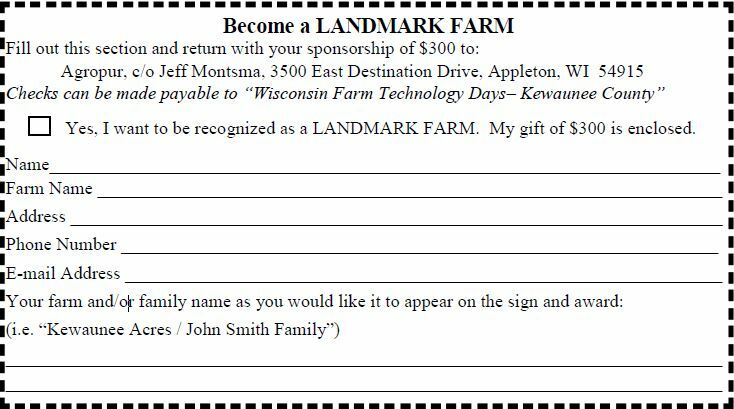 This gift will support the general fund of Kewaunee County Farm Technology Days event. Any remaining funds after the event will stay in Kewaunee County and be dispersed by agricultural peer committee to youth education, outreach and other agricultural related opportunities. Why Become a LANDMARK FARM? Hosting Farm Technology Days is an honor for our county that may not come around again for decades to come. Your gift to the LANDMARK FARM project entitles you special recognition during the show and for years to come.